London trains and stations get my attention. But throw in cute animal photographs and I’m hooked. 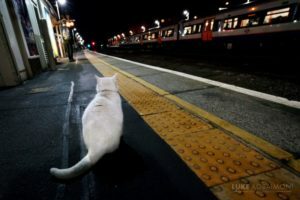 Many model railways feature tiny versions of their builder but judging by these beautiful photos of animals around London underground stations taken by Luke Agbaimoni at tubemapper.com we should be including our pets too. Of course, animals on stations are nothing new and signal boxes were often owned by a cat. But I rarely see animals the centrepiece of a station view as they are in Luke’s photographs and I’m sure you’ll agree it adds a whole different dimension to a scene. Does your model railway feature a plastic pet or animatronic animal? If not, why not?